Occupying the BFC Show Space at Brewer Street Car Park, Peter Pilotto chose to forego the nondescript white benches, instead opting for woven deck chairs. Netted sculptures in bright primary colours lined the runway. The BFC space, with ample natural light, deserved the gentrification, if only for a show. Trust Peter PIlotto to display something that didn’t detract from the clothes but as a palette cleanser prior to the show. There was an effortless power to the way Julia van Os opened the show. Her pinstripe, viscose waistcoat and knit skirt with two centre splits was stunning. A vacation to Greece, earlier in the year, inspired Pilotto and design partner, Christopher de Vos. Swept away by the traditional peasant embroidery, the textiles and the seaside, they made their way into the collection. The crop tops This prettified vision of Greece contrasts starkly to the fiscal crisis the country is enduring. Unlike other London designers, there is something utopian at the heart of this label. Other hot destinations, deserts for example, were in mind during the design process. The whole collection felt like the escape section of Portermagazine: expensive, lavish and breathtaking. Paying homage to what garnered them critical renown, there was a slew of printed looks at the end of the show. A richly floral printed skirt, with mathematic matter also adorning it, was veiled by white netting. Innovation is key when tackling old favourites. Providing stylists with red carpet-worthy garb, a ruffled dress with lace trim featuring a glimpse of net at the waist and white fastenings. There’s something mathematical about the way this duo design. Not only am I talking about the way their clothes are precisely tailored, but the symbols used, especially in this collection. Triangles and circles were plastered on skirts, dresses and tops. Geometry, something that the Peter Pilotto perfects in their collections; from geometric shapes to prints. Certain pieces looked like the formula for a difficult equation. 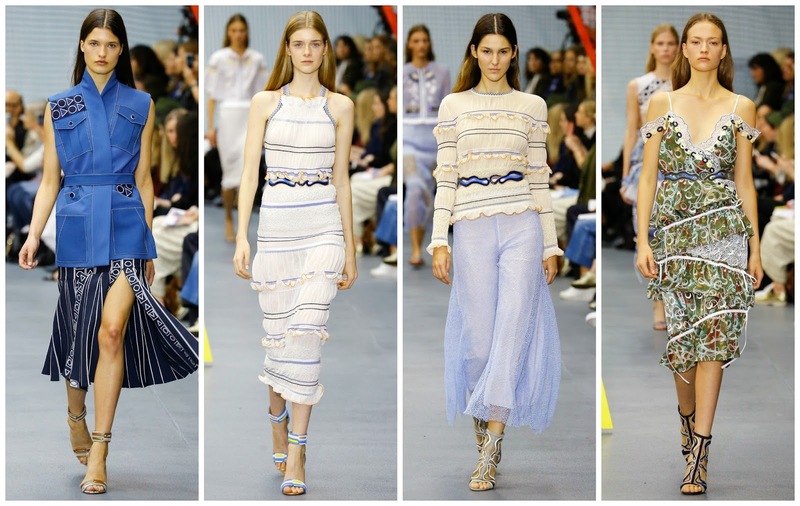 A tried and tested formula is what Pilotto and de Vos have developed over the years. They are renowned print masters—London’s finest, one might say—and they create interesting shapes that flatter the wearer and illuminate her, adding an undoubted intrigue to the look. Subtracting heavy use of printing this season, the duo have arrived at a well calculated breath of fresh air.